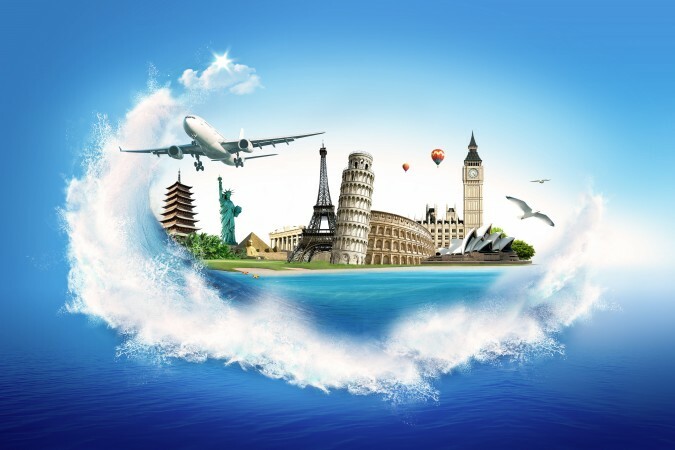 Trip around the world: Prague-Rome-Tokyo-Manila-Los Angeles-Paris for €643! Have you ever dreamed abour traveling all around the world? You can make your dreams reality now and it won’t cost you fortune either! Around the world ticket on route Prague-Rome-Fukuoka-Tokyo-Manila-Los Angeles-Paris (-Rome-Cairo) will cost you only €643 now! This amazing offers is combination of two tickets from Alitalia and Philippine Airlines. You will have 1 night stopover in Rome, enough to see the most important places in the city and then return flight from Los Angeles to Paris and to Rome before flying to Cairo. Unless you are interested in Egypt we recommend to end your journey in Paris or Rome and fly back to Prague or any other city where you live with low cost airline as Easyjet, Ryanair or WizzAir. departure: 7./14./21.10., 2./8./23.11., 7./14./27.12., 6./18./24.1., 7./14./15./22.2. return: 10.-30.11., 1.12., 11.-31.1., 9.-27.2. 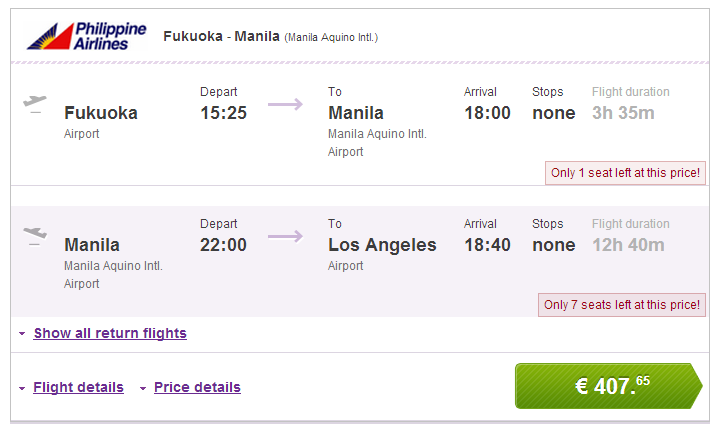 This second ticket will take you from Japan to Philippines and then to Los Angeles. You can either take a bus/train from Tokyo to Fukuoka if you want to get the lowest price or you can also fly from Tokyo to Manila for ~€15 Euros more. You can also fly to San Francisco instead of Los Angeles for the same price. Both flights are direct. 1.11.-15.12., 3.-31.1. (only departure), 1.-28.2. 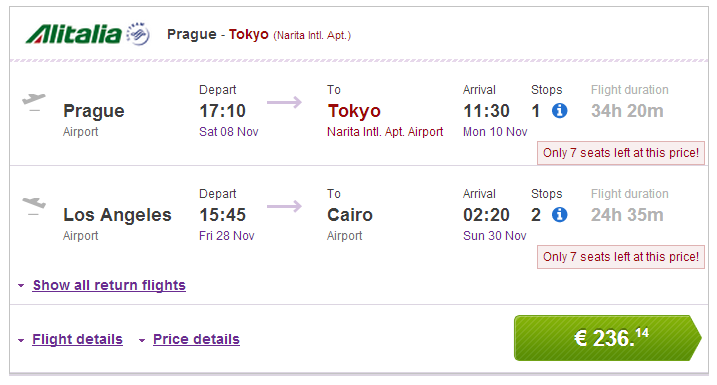 Total price for this round the world (RTW) ticket is only €236+€407=€643! Prague – Rome 8.11 . Manila – Los Angeles 20.11. Los Angeles – Paris 28.11. Japan and Philippines are visa-free for most European countries, you need valid ESTA or US visa for USA. If you have any questions feel free to ask in comments. « New Ryanair route: Prague-Brussels Charleroi from October!